Chilli Padi offers Malaysian expats a taste of home. For the rest of us, it's just good eats. Don't neglect to order a cup of the teh tarik, or Malaysian hot "pulled" tea. Hours: Sun.-Thu. 11 a.m.–10 p.m., Fri.-Sat. 11 a.m.–10:30 p.m.
Cantonese food might reign supreme in Oakland's Chinatown, but the new kid on the block is a modern-looking restaurant that boasts no roast ducks hanging in the window, or dim sum carts clattering away. Instead, at Chilli Padi, you'll find Hainanese chicken rice, "pulled" tea, curry laksa, and other dishes made famous by the street hawkers of Malaysia and Singapore. 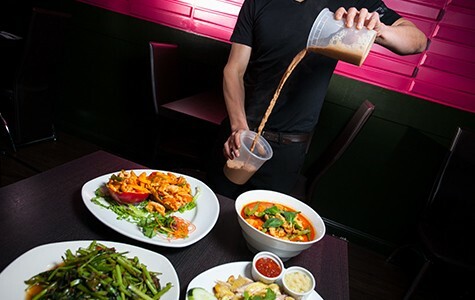 Open since mid-November on the busiest stretch of Chinatown, Chilli Padi also serves a hodgepodge of Thai and Chinese dishes, but it's mainly a Malaysian restaurant — the only one I'm aware of in the near East Bay. 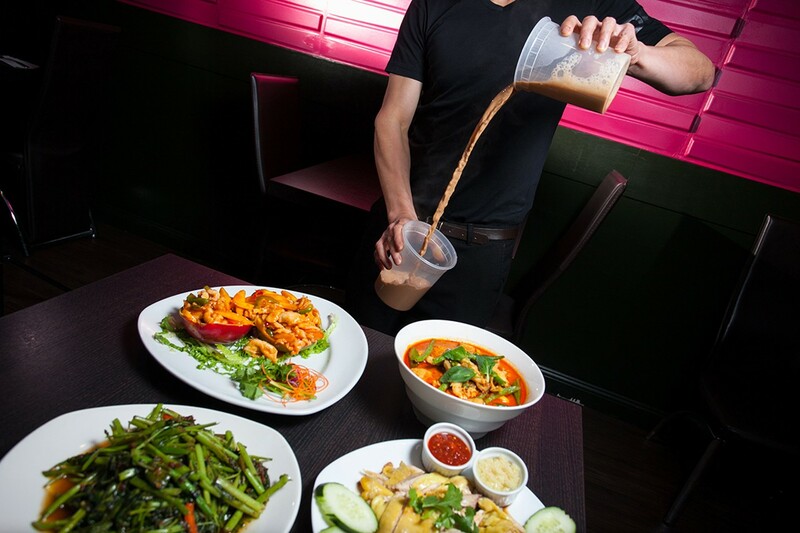 The restaurant's chef-owners are Malaysian natives Kee Wong and Hon Chan, the latter of whom previously cooked at Union City's now-shuttered Banyan Garden. Service is typical Chinatown: friendly and efficient, if occasionally brusque. Food in Malaysia and Singapore is a melange, with Chinese, Indian, Thai, and Indonesian influences all vying for prominence. For the uninitiated, the (very loosely) Indian-inflected dishes are some of the most unique offerings. Indeed, the Chinese name for the appetizer known as roti canai is "Indian bread" — the kind of griddled flatbread you'll find at many Southeast Asian restaurants, served with a curry dipping sauce. Crisp and flaky on the outside, chewy on the inside, Chilli Padi's version was better than most. Better still was the mee goreng ("Indian stir-fried noodles," according to the Chinese), which featured beautifully charred egg noodles and shrimp, bits of scrambled egg, crisp bean sprouts, and chunks of curry-infused potato so soft they were practically mashed. The chunks of curried potato were also my favorite part of the dry curry lamb dish, which, as its name suggested, was less saucy than your typical curry — a flavor-packed vehicle for crisp green beans and uncommonly tender lamb. But my favorite item may have been a curry noodle soup known as laksa mee, which included strips of tender chicken, fried tofu puffs, soft-cooked eggplant and okra, and toothsome egg noodles all served in a reddish-orange coconut curry broth that was rich and comforting, with just a hint of chili heat. 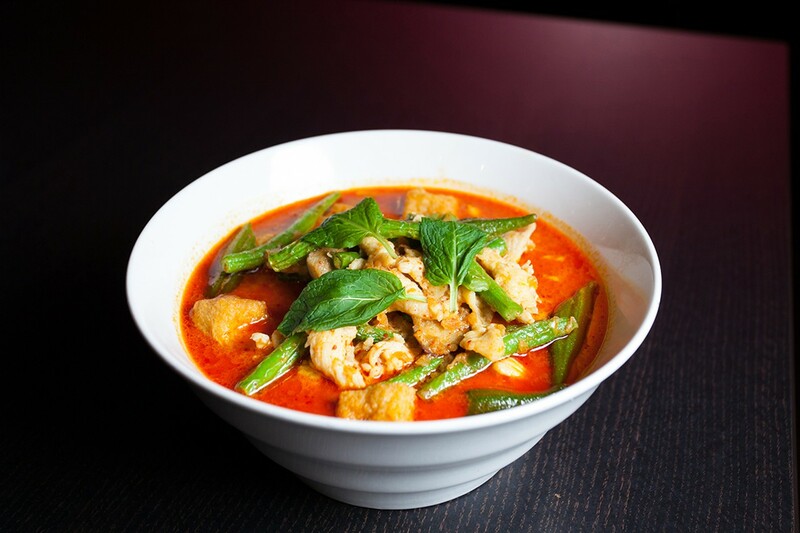 The restaurant's name, Chilli Padi, is the Malaysian term for what you might know as the Thai bird chili — those thin, hooked-beak peppers that provide a fiery exclamation point for many Southeast Asian dishes. In truth, the name is something of a misnomer: While Malaysian food is known in part for its heat, the chefs at Chilli Padi dial the spice way back, perhaps to cater to the tastes of the restaurant's predominantly Chinese clientele. I would have liked a touch more heat for the curry dishes in particular — next time, I'll ask for "Malaysian spicy" and see if it makes me break a sweat. If there's one ingredient that best defines Chilli Padi, it isn't the chili but rather the belachan (often spelled "belacan"), a famously pungent shrimp paste. Sauté a mere spoonful with dried shrimp and various aromatics, and you wind up with a sauce that has the saltiness of fermented black beans, the umami funk of fermented seafood, and an appealingly meaty texture — something to work your teeth on. One of the most luxurious dishes at Chilli Padi is a whole Dungeness crab (reserved in advance, because the restaurant doesn't have a live tank) fried in a wok with dried chilies and belachan sauce. If you like Cantonese salt and pepper crab, you'll like this — with the added bonus of those salty, shrimpy bits that cling to the carapace and are infused into the rich tomalley. Depending on the market price, one crab will probably run you upwards of $32, or about twice as much as anything else on the menu. It's a worthy indulgence. Many of the vegetable dishes also feature belachan. In fact, the highlight of one meal was a homey plate of kang kung belachan — water spinach (what the Cantonese call ong choy) stir-fried until tender and accented with little bursts of the salty shrimp paste. One of the challenges at Chilli Padi is simply deciding what to get — two veritable feasts into the restaurant's repertoire, I still hadn't gotten around to ordering even half of the dishes that sounded interesting. I'm glad, however, that I didn't miss out on the Hainanese chicken, a dish that's particularly popular in Singapore, often sold by street vendors. 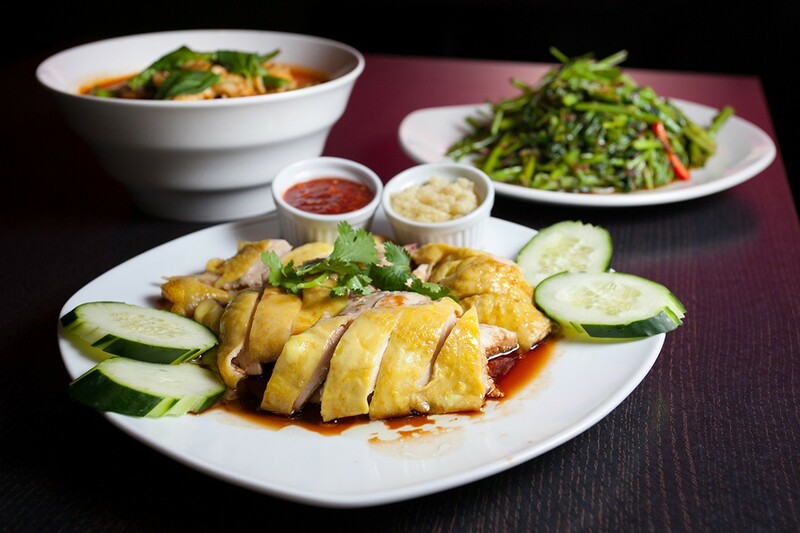 Here in Oakland, fans of Hawker Fare's kao mun gai will recognize this not-so-distant cousin. The chicken had been gently poached until tender, then taken off the bone, drizzled with a mild soy sauce dressing, and served with the traditional accompaniments: cucumber slices, chili sauce, and — the best part — a little tub of minced ginger, the perfect condiment for poached chicken. I take that back: The best part was the bowl of yellow-tinged rice that was infused with all the chicken-y flavors of the poaching broth and other aromatic goodness that Ken Chang, who helps manage Chilli Padi and serves as its English-language media liaison, was reluctant to disclose. A restaurant has to have its secrets, after all. Chilli Padi's menu is loaded with unexpected pleasures for the diner who's willing to try something new. Lobak rolls featured tofu skins that had been stuffed with a ground-pork-and-mashed-taro filling similar to what you find in the taro dumplings served at dim sum houses, and then fried until crispy and spring-roll-like. The "BBQ Fish" turned out to be a whole mackerel that had been slathered with a savory belachan-infused sauce, wrapped in a banana leaf, and roasted until the belly was luxuriously tender. As long as the restaurant isn't too busy, dessert — fried bananas, perhaps, or a sweet coconut-milk soup filled with black-eyed peas, soft chunks of taro and sweet potato, tapioca balls, and other hidden treasures — comes free. Whatever you do, don't neglect to order a cup of the teh tarik, or Malaysian hot "pulled" tea, which Chang told me is prepared in the traditional way I've seen street vendors in Asia do it: A thin stream of black tea and condensed milk is poured several times from a great height in order to give the drink its characteristic frothiness. The tea is more potent and less cloyingly sweet than most of the Thai milk teas you'll find around town. For Malaysian expats, it's a taste of home that, until recently, they needed to travel a long way to find.